overview : John Fogerty performing solo on his "Long Road Home" Tour. 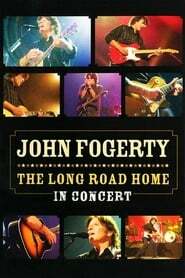 Recorded live in concert 2005 at Los Angeles' legendary Wiltern Theater, this one of a kind concert DVD serves as the perfect companion piece to last year's CD The Long Road Home, The Ultimate John Fogerty - Creedence Collection. Included are 26 electrifying versions of CCR and Fogerty solo hits. Martyn Atkins directs this high-definition video mixed in 5.1 dolby digital stereo and dolby digital 2.0 stereo. Also included is a bonus exclusive video. Former Creedence Clearwater Revival singer John Fogerty has managed to forge a profitable solo career for himself since the dissolution of the group that made his name. Here, Fogerty performs a mixture of solo and Creedence-era work, including version of hits such as "Bad Moon Rising" and "Fortunate Son." The show was captured on camera at Los Angeles' Wiltern Theater.